I thoroughly loved this scenario, but be warned, this one is NOT for the squeamish. It features body horror, gore and suspense. Because this scenario really benefits from all players being surprised, I won’t be saying anything else about the events contained within. What I will say is that I enjoyed everything about it and had no issues as either a player or GM. I also enjoyed that it connects to lots of other adventures in a tangential fashion. A very fun space combat with an interesting set up and very interesting opponents. I really enjoyed it. The exploration of the ship is very creepy, and gives both players and GMs the chance to turn it up to 11. The PCs are brought in to locate the source of a distress beacon sent from a ship from Sangoro's Bulwark, the lost headquarters of the Exo-Guardians. The premise is straightforward: something must've gone terribly wrong with this ship, so you'll need to secure the distress beacon, use it to find the ship, and investigate. With a unique space combat and an atmospheric and spooky dungeon crawl with cool encounters, this scenario just brings a really high quality experience. The mysteries on the ship are also well designed to give players just enough information to tease out what happened to the Struggle's Scholar while keeping things surprising. The last third of the scenario does suffer from some issues with just being too transparently linear. But as opposed to some other reviewers, I feel that can be excused for the sake of maintaining a good narrative arc (and this one nails that arc well, concluding in an unexpected and exciting encounter). The veskarium ship and its captain are a breath of fresh air. Clear, solid motives and an unyielding commitment to honor give the PCs a political and social dilemma. Risk the loss of the beacon by accepting the Honorbound's terms for a 'ship duel', or risk making the already tense relationship between the Pact and the Veskarium worse by ignoring them. While ultimately it doesn't matter too much in this scenario, this is the kind of dilemma that gets players of all sorts engaged in the narrative. Losing the duel has real consequences to the rest of the scenario, other than just 'you-fail', and they're well thought out ones too. The atmosphere on the ship, from the dim and flickering lighting, to the increasingly malfunctioning turret, to the horrid fates of the creatures within, is uniformly excellent. The map for the ship is unique and well detailed, and the handouts and "video recording" both did a good job of reinforcing the atmosphere and getting speculation going within the group. The scenario provides a unique and uniquely useful tool for fighting the driftdead that appears near the end: a force baton that acts as a force effect vs. incorporeals. Very good from an adventure balance standpoint and a cool item to have access to after the scenario. There's some attention given here to not only terrain but environmental effects. Dim lighting, the etheric storm messing with powered gear, obstacles for cover in the bridge room, etc. Add in monsters that also have unique powers to throw at you and it all helps to make the encounters more interesting. Another adventure, another space combat that drags on way past its welcome. While the unique elements (special honorable rules, asteroid field) add a bit of interest to the fight, by the time we were in round 8 and out of missiles we were more than ready for it to be over. Mercifully our GM 'called' the combat once it was clear that our ship was well in the lead. I wish space combats were rebalanced across the board, lowering either ship HP totals or reducing shield repair rates. By the time we had picked up the second battery and were bringing it back to the engine room, the linear nature of the adventure had become glaringly obvious. This is especially disappointing after the first portion of the ship, which lets you explore freely. The ending is somewhat unsatisfying, as the data you went to retrieve from the ship is not decoded as part of the scenario, so you never find out what was going on with the Bulwark. You just get a pat on the back! After all the build up and possible close calls against the xill and driftdead, it'd be nice to also have a solid meta-plot revelation as a reward. The scenario with some horror/suspense music makes for an enjoyable experience. 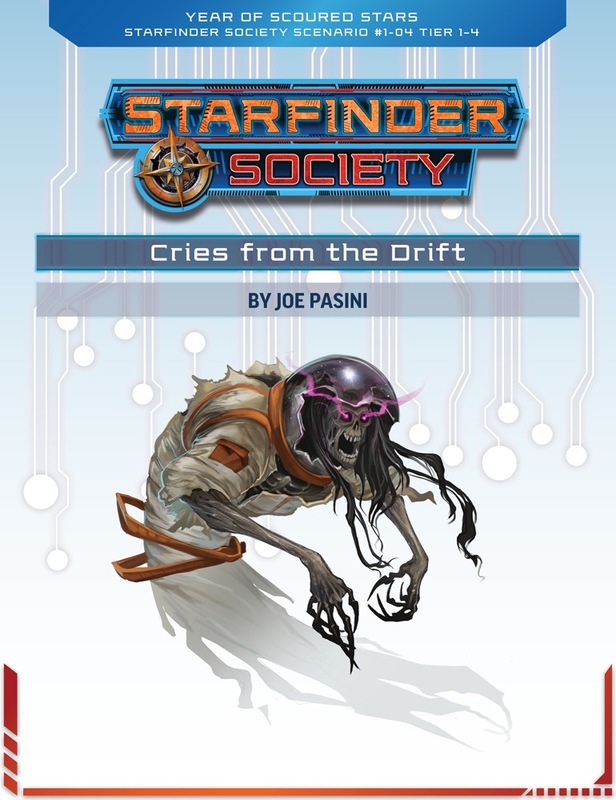 The difficulty compared to other Starfinder scenarios is higher. Probably my favourite SFS scenario so far.. While mileage of this adventure will drastically vary depending on your GM - but in the right hands this shapes up to be a very suspenseful and chilling scenario that leave the players on edge and immersed. What maps will this scenario call for? Is there a reason this scenario is still listed as "(Pending)" on my Starfinder subscription? I've already received the next two. You should contact Customer Service about that. Something went wrong. They should be able to fix it after they get back to the office on Monday. This adventure, when I played it, was completely boring. 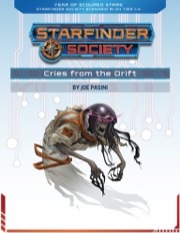 I played it in Starfinder and there is such a high emphasis on Engineering and Computers that I just didn't have. As a Solarian I felt completely worthless and useless in this game. The Space Combat was interesting, everything else was a complete snooze. I seriously felt like I could have left the table and had no impact on the game. That is bad adventure design. There should always be significant things for any type of character. Not just those who chose to be "Skill Monkeys" which we had. So the rest of us sat back useless as one character had a +10 to +12 in every skill. It was not fun and I just wanted it to end. Sorry you felt that way. There are fewer skills in Starfinder, and some classes (like the Operative) that gets so many skill points and inherent bonuses to skills that it is easy for them to be good at pretty much everything. Still, that being said, I've run this adventure and there's lot of role-playing to be had in figuring out what to do next (and how to do it), not to mention some really exciting combats. The fight against the "big threat" lasted 1 round. Literally it died before acting. The other one took 3 rounds. There wasn't much room for roleplaying because the skill monkeys just rolled to know *everything* and thus... Well aside from the brief conversation with the Vesk... Nothing for me to do. My recommendations would be for there to have been damaged portions of the ship where physical things such as Strength checks and Athletics checks would have been useful. Maybe have a tear in the hull, or something where characters have to jump it? Or a door that can only be opened via strength? Something so more physical characters don't go for 2+ hours without being able to do any rolls aside from "assist" all the time.